Players from around the world will light up this season's Heineken Cup as European rugby's flagship club tournament embarks on its 14th season. Here, PA Sport rugby union correspondent Andrew Baldock looks at some of those headline acts vying for top billing. 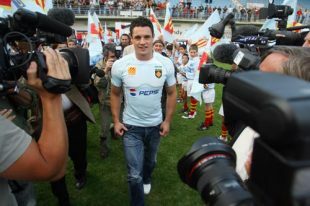 All Blacks superstar Carter has joined Perpignan on a lucrative six-month contract that could earn him around £30,000 a game. Likely to make his debut against Leicester in December, he has already attracted a four-figure crowd to Stade Aime Giral when the Catalan club paraded him to their supporters last month. On his day, a fly-half without equal. Ospreys speedster Williams is among the nominees for the International Rugby Board's player of the year for 2008, and few could argue with such recognition after he established himself firmly among the world game's finest finishers. Box office material who rarely lets down his audience. Former Australian rugby league star Gasnier moved to Paris from St George Illawarra this summer on a six-figure deal. A league legend down under, 27-year-old Gasnier was an Australia Test side and State of Origin regular, and he has already shown glimpses of his ability in the Top 14 French Championship. Likely to feature on the wing for Stade. On course to guide Wasps through their Heineken Cup campaign after recovering six weeks ahead of schedule from an horrific ankle injury. The England fly-half can turn a game in an instant, while his game-management shows maturity way beyond his 20 years. Wasps know they have a priceless gem in the ranks. New Zealand try machine Howlett followed Australian Rod Kafer as only the second player to win Super 14 and Heineken Cup honours when he helped Munster land last season's European silverware. Scored 49 tries in 62 Tests for the All Blacks and remains among the most lethal marksmen around. Limerick-born Earls is waiting to be unleashed on this season's Heineken Cup. He might not be a household name like team-mates Paul O'Connell or Ronan O'Gara - yet - but his impact could prove just as significant. A prolific try-scorer with pace to burn from full-back or centre, watch out for this thrilling new kid on the block. Scrum-half Care has proved an integral part of the Dean Richards-inspired Harlequins revival, rising to his current status as England's premier number nine. Quick, incisive and deceptively strong, he is a constant menace for opposition defences. Could lead Quins to only their second Heineken quarter-final. Made a name for himself at last year's World Cup when he achieved what many thought impossible - he beat South African speed machine Bryan Habana for pace on the outside - during the USA's pool game against the Springboks in Montpellier. He has already scored half a dozen tries for Biarritz this season and might just give them an attacking edge they have lacked in recent European campaigns. The Scarlets suffered a dismal European campaign last term, losing all six pool games and conceding more than 200 points, but Australian number eight Lyons could help transform their fortunes. Capped 40 times by the Wallabies, he looks like an astute summer signing and a player who will relish top-flight European competition. A player of monumental significance if Wasps are to threaten to land a third European title in six seasons. England's tireless openside flanker rarely delivers a poor performance and now that his injury troubles of recent seasons are seemingly behind him, the best is surely yet to come.